FREE for a limited time – Swapsies Sports. 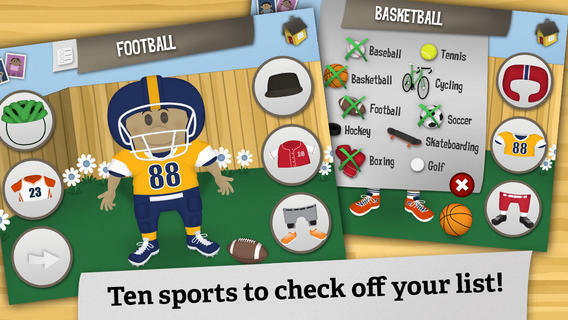 This educational app features 10 mini games based on sports: football, basketball, baseball, soccer, hockey, golf, tennis, boxing, cycling and skateboarding. There are two different modes: a dress-up game and an interactive quiz. In the dress-up game mode, kids mix-and-match hats, tops, & bottoms to find the correct combination. Kids will have lots of fun matching and mismatching the clothes on 6 different characters. Once the clothes are properly matched, a fun activity is unlocked for each sport. The quiz mode is age-appropriate. Kids are asked to make connections, reason, and classify. Nicely done for little ones!